Received 30 August 2010; revised 9 September 2010; accepted 16 September 2010.
treatment of tobacco addiction in healthcare. which sufficient knowledge is already available. ing smokers are from lower socioeconomic classes [3,4]. other developed countries has remained stable for years. 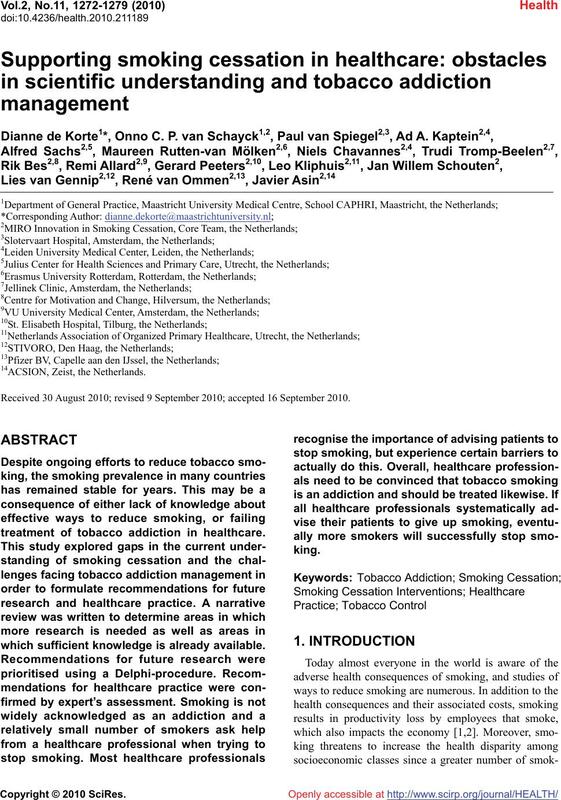 facing tobacco addiction management in the Netherlands. uted to this article are members of the MIRO core team). mary prevention) is outside the scope of this study. gaps in the scientific understanding of smoking cessation. supporting individuals’ attempts to stop smoking. cycle and are listed in Table 1.
as from the personal archives of the core team members. ment”, “harm reduction” and “relapse”. resulted in recommendations for follow-up research. produced his or her own top-10 list of recommendations. Figure 1. 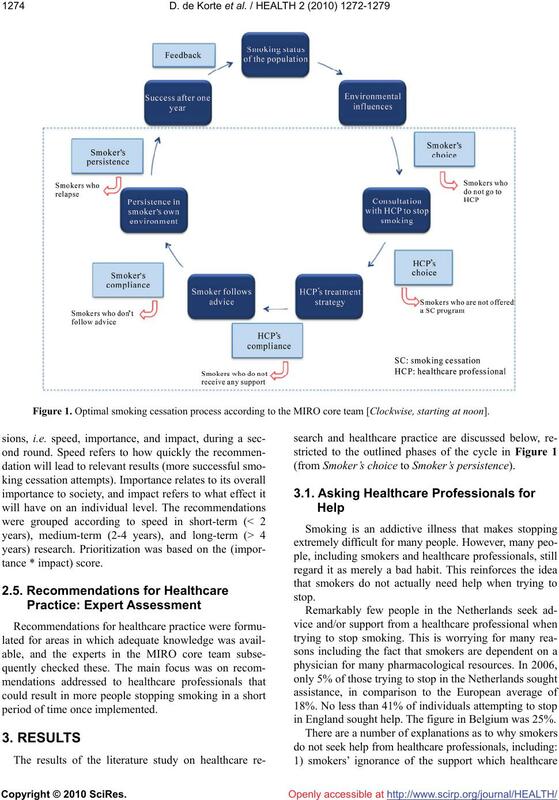 Optimal smoking cessation process according to the MIRO core team [Clockwise, starting at noon]. period of time once implemented. (from Smoker’s choice to Smoker’s persistence). in England sought help. The figure in Belgium was 25%. Q1.Why is focusing on and investing in smoking cessation so important? Q2. How is a person influenced by his or her environment? Q3. What are the effects of interventions carried out by people from the smoker’s environment? Q4. How can the influence of a person’s environment be better utilized? Q5. Why is it important for a smoker to see a healthcare professional? Q6. How many smokers are currently seeing healthcare professionals? Q7. Why aren’t more smokers seeing healthcare professionals and how can this situation be improved? Q8. Why is it important to create a smoker’s profile? Q9. How effective are the various smoking cessation methods and which one is the best? Q10. What are healthcare professionals currently doing? Q11 . Why aren’t healthcare professionals doing more and how can this be improved? Q12. Why is support from a healthcare professional important? Q13. How often are people who have stopped smoking supported by healthcare professionals and why does this not happen more frequently? Q14. How can we increase the percentage of people who attempt to stop smoking receiving support? Q15. How many people who attempt to stop smoking persist in their own environment? Q16. What challenges do people who attempt to stop smoking face? Q17. How can we increase the percentage of people who have stopped smoking managing to persist in their own environments? Q18. 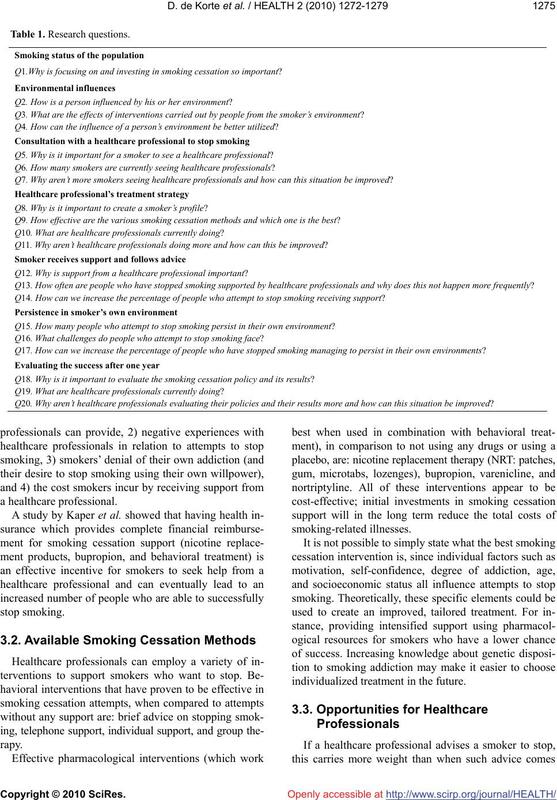 Why is it important to evaluate the smoking cessation policy and its results? Q19. What are healthcare professionals currently doing? Q20. Why aren’t healthcare professionals evaluating their policies and their results more and how can this situation be improved? individualized treatment in the future. to a lack of adequate funding. several attempts before they completely stop smoking. ther study needs to be done on this topic. ficient knowledge is available, but not put into practice. ally lead to more people stopping smoking. Table 2. Top 15 recommendations for follow-up research prioritized by (importance * impact) score. study the effect that this measure has on passive and active smoking and health. vide the best support for patients attempting to stop smoking. fectively support patients in their efforts to stop smoking. ing behaviour and how a healthcare professional can help them. more people who successfully stop smoking. provide when it comes to stopping smoking. recognized by both smokers and healthcare professionals. tually more smokers will successfully stop. 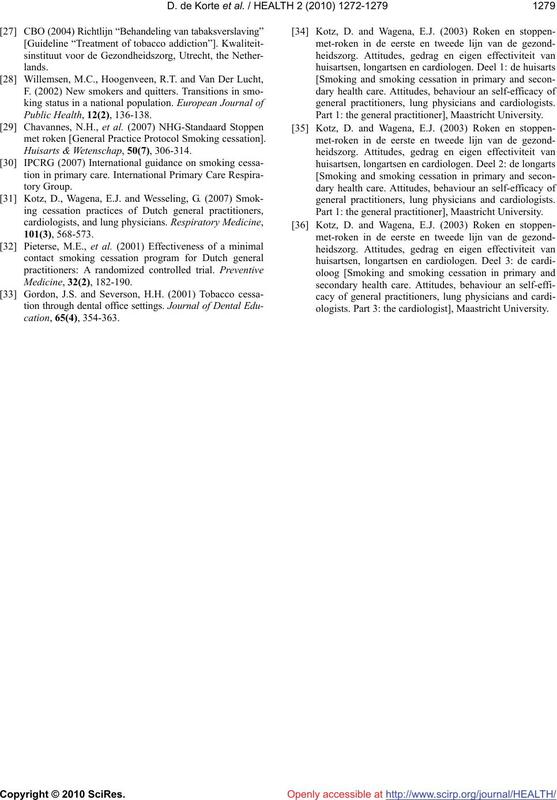 stricted grant from Pfizer B.V.
 Jacobs-van der Bruggen, M.A.M., Welte, R.A., et al. related productivity loss for Dutch employers in 1999]. Droomers, M., Schrijvers, C.T. and Mackenbach, J.P.
(2002) Why do lower educated people continue smoking? Survey. European Respiratory Journal, 27(3), 517-524.
smokefree future, the Hague, the Netherlands. Willemsen, M.C., Wagena, E.J. and van Schayck, C.P. lands Tijdschrift voor Geneeskunde, 147(19), 922-927.
and Control], Lemma B.V., Utrecht, 265-282. TNS Opinion & Social (2007) Special Eurobarometer. cessation aids. BMC Public Health, 8, 129.
of Systematic Reviews, 2, Article No. CD000165. 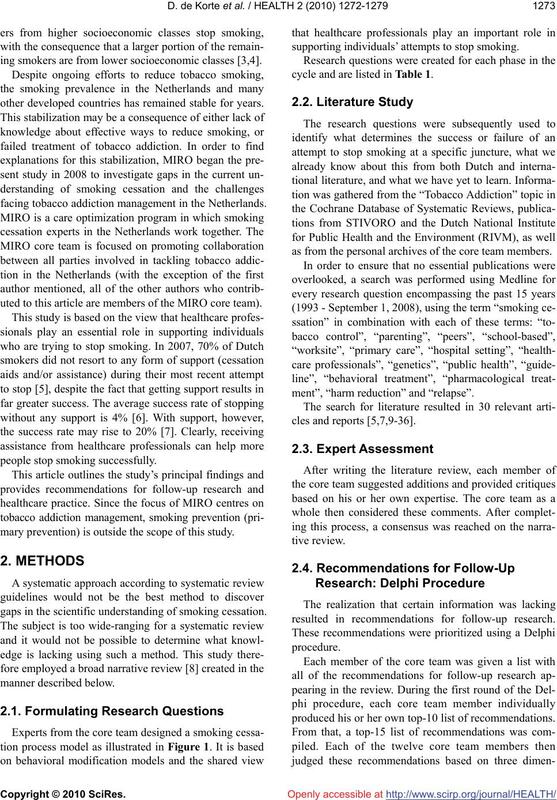 tabase of Systematic Reviews, 3, Article No. CD002850. 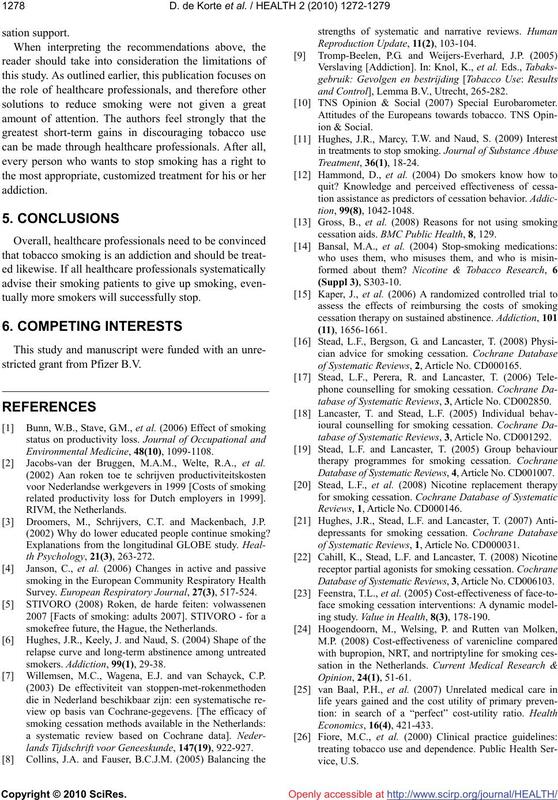 tabase of Systematic Reviews, 3, Article No. CD001292. Database of Systematic Reviews, 4, Article No. CD001007. Reviews, 1, Article No. CD000146. of Systematic Reviews, 1, Article No. CD000031. Database of Systematic Reviews, 3, Article No. CD006103. ing study. 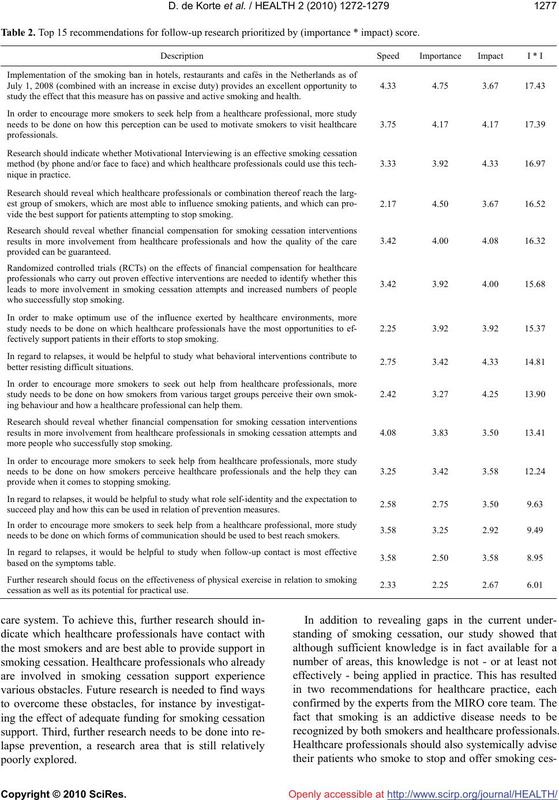 Value in Health, 8(3), 178-190.
met roken [General Practice Protocol Smoking cessation]. Huisarts & Wetenschap, 50(7), 306-314.
general practitioners, lung physicians and cardiologists. 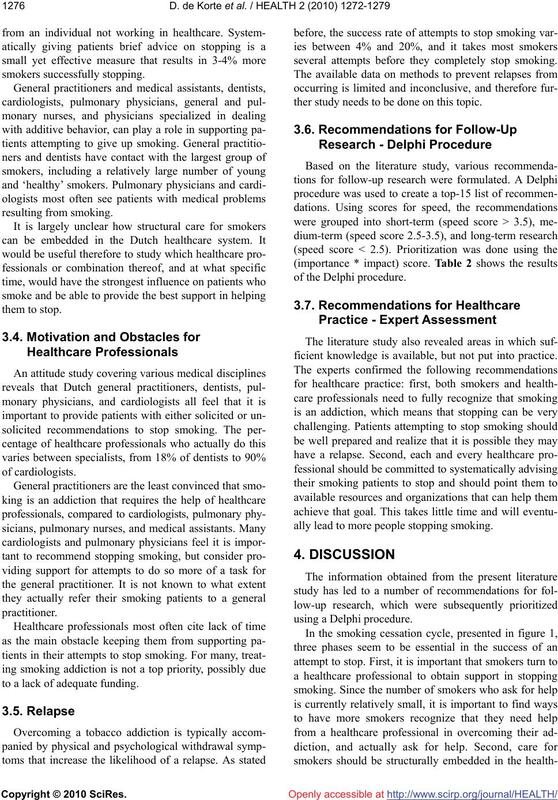 Part 1: the general practitioner], Maastricht University. ologists. Part 3: the cardiologist], Maastricht University.